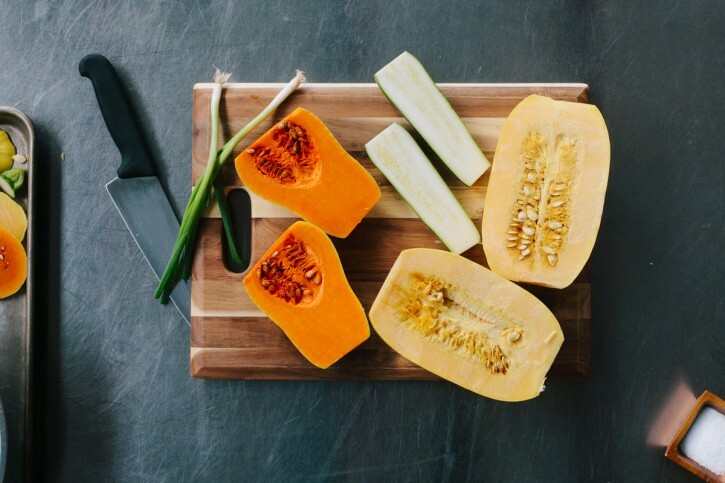 Halve the spaghetti, butternut and zucchini squashes lengthwise. Leave the skin on the spaghetti squash. It won’t be edible, but it will help hold everything together. Peel the skin of the butternut squash. You can leave the zucchini skin on. Scoop out the seeds from each squash half and discard. Continue to hollow out each squash to allow the next smallest squash to fit inside the cavity of the larger one. Reserve the flesh you scoop out to add to the stuffing. 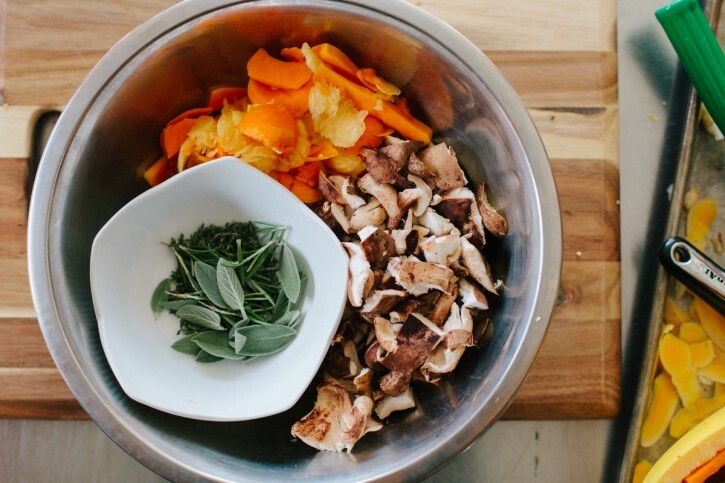 To make the stuffing, combine 8 ounces of the squash flesh trimmings, the shiitake mushrooms, garlic and fresh herbs in a food processor. Pulse until the ingredients are coarsely chopped and uniform in size. Preheat a Lodge Logic cast iron skillet over medium heat. Add the oil. 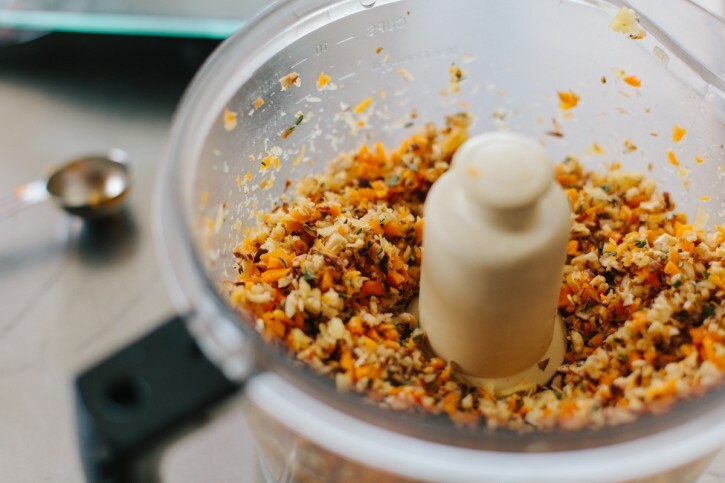 When the oil is hot add the mixture from the food processor, as well as the vegetable stock. Season with Cattleman’s Grill Tri-tip Seasoning and salt. Cook until tender. Taste and adjust seasoning. Transfer the stuffing mixture to a mixing bowl. Fold in the bread crumbs, parmesan and egg. Mix well. 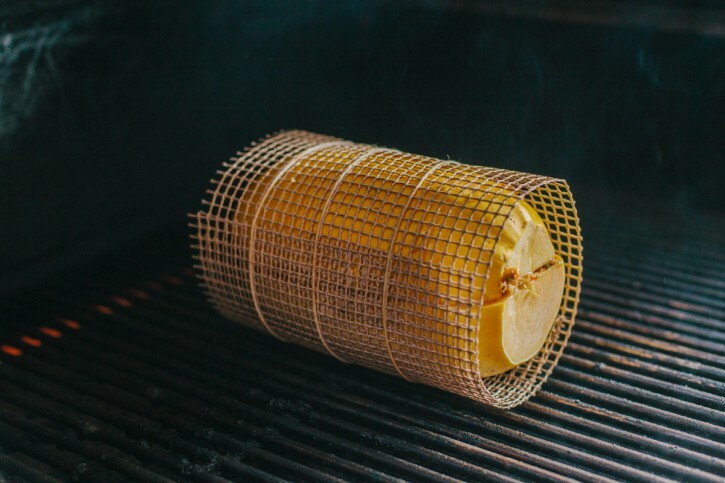 Preheat your Yoder Smokers YS640 to 275ºF, set up for smoking/indirect grilling. Rub the flesh of the hollowed out spaghetti squash with a little olive oil. Season with salt and Cattleman’s Grill Tri-tip Seasoning. Spread a layer of stuffing over the surface. Place the butternut squash inside the spaghetti squash. Pack on another layer of stuffing. Lay the zucchini inside the butternut squash. Layer in more stuffing. Trim the length green onion to fit the squash. 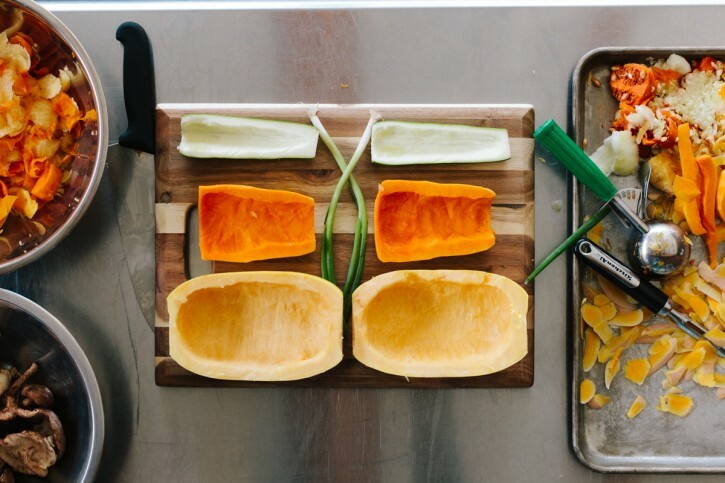 Repeat the process with the other halves of the squash. Place one half of the squash-ducken on top of the other and roll tightly with a FrogMat. Tie a few lengths of butchers twine around the FrogMat to hold everything in place. Transfer the squash-ducken to the cooker and smoke for one hour. Remove from the cooker and turn the cooker up to 375ºF. 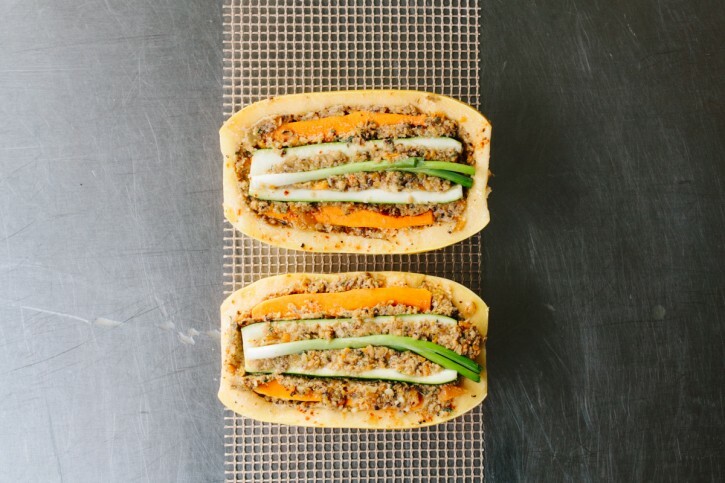 Wrap the squash-ducken in foil and return to the cooker. Continue cooking until a probe or paring knife inserted in the center meets little resistance, about one more hour. Remove the squash-ducken from the cooker. Unwrap the foil and FrogMat. Carefully slice rounds and serve warm. You may be familiar with the turducken; a chicken stuffed into a duck stuffed into a turkey. It’s become quite popular as a holiday dinner centerpiece in the last several years. Well, it turns out that the idea translates pretty well to the squash world. 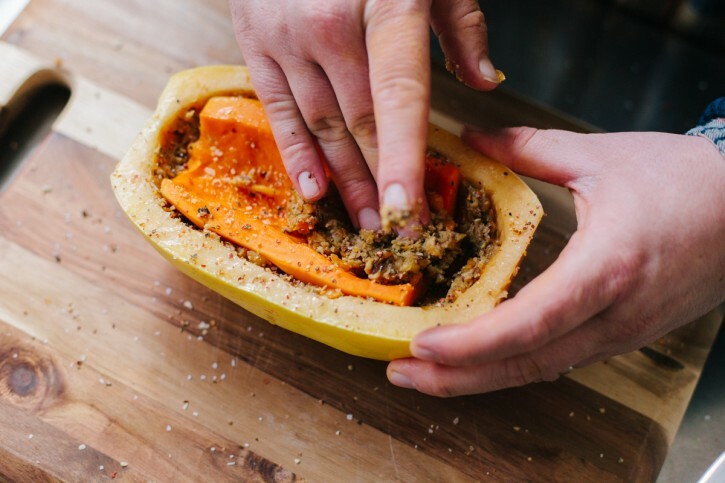 So, we’re stuffing a zucchini inside a butternut squash inside a spaghetti squash. 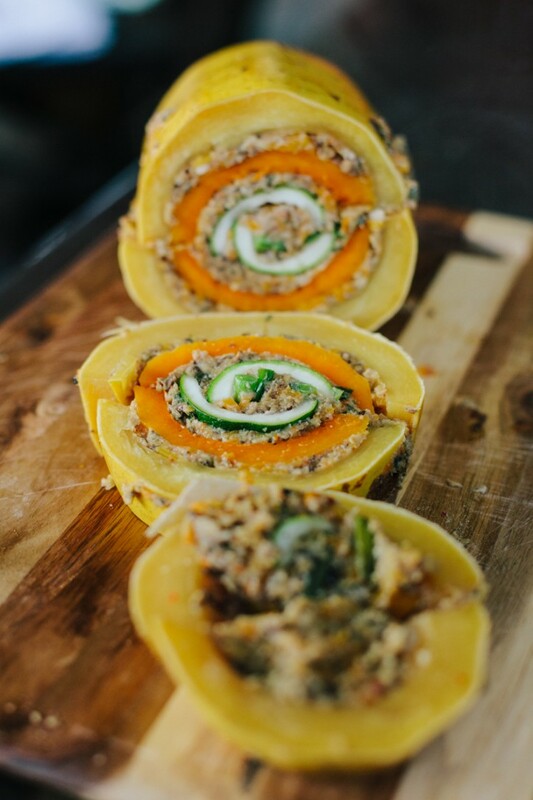 Unfortunately, spag-but-chini doesn’t have the same ring as turducken, so we present to you the Squash-ducken! This savory vegetarian dish has all of those Thanksgiving flavors you’re familiar with and works great as a side or main dish alternative for your friends and family who aren’t meat eaters. You’ll need to do some sculpting to make sure everything fits just right. Just be sure to hold onto the flesh of the squash that you scoop out (you can pitch the seeds, though). We’ll use that extra squash in our stuffing. Forget the boxed stuffing. 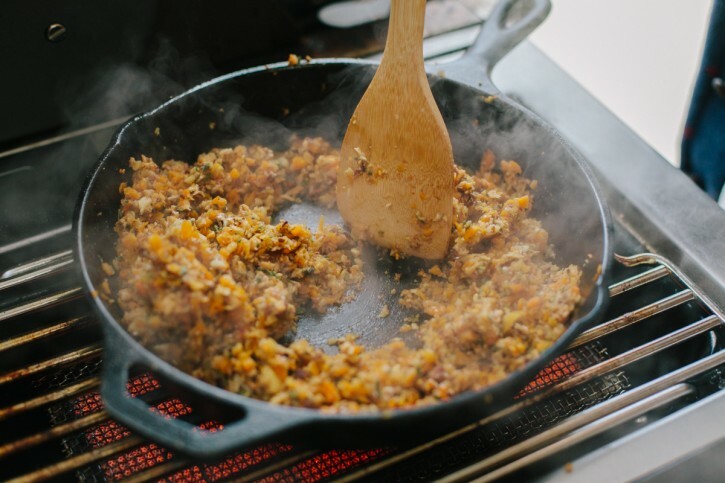 I’d put this vegetarian stuffing up against the best of the best! I haven’t mentioned this yet, but it is BEAUTIFUL! Looks as good as it tastes, and vice-versa!